Michael Sprague, coordinator of Mass Audubon’s turtle rescue program, with two Kemp’s ridleys. TRURO — Michael Sprague pulls the van into the empty parking lot at Corn Hill Beach, parks quickly, pulls on a pair of gloves, and hustles once again toward the sand. Sprague, a biologist who is the coordinator of a turtle rescue program at the Massachusetts Audubon Society, makes a right on the beach and walks north as he reads the directions written on the form in his hand. As he walks, he points across the bay toward Provincetown and the distant outer tip of Cape Cod. “That’s where the turtles make the decision of their lives,” he said. This summer, a historic number of critically endangered sea turtles have made the wrong decision, to swim past Provincetown into Cape Cod Bay. Now, with the water growing more frigid by the day, they can’t find their way out and are washing up on beaches like nothing in recorded history. There has been no year even close to this one. 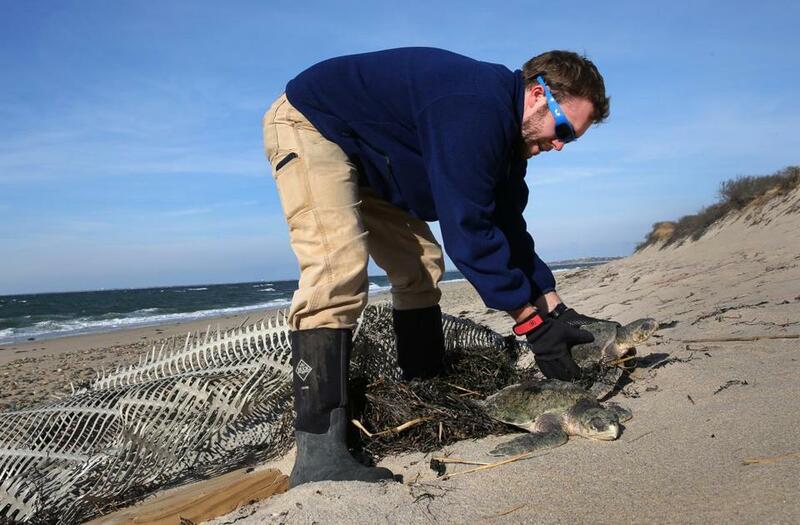 Volunteers are working to save endangered sea turtles trapped in the chilly Cape Cod Bay. Sprague rushes toward the location written on the directions and spots a pile of debris and, right next to it, a clump of eelgrass. Sprague drops to his knees and lifts the clump to reveal a Kemp’s ridley sea turtle, the most endangered sea turtle species in the world. The caller who reported it to the hot line had done exactly as instructed, tucking the turtle in the eelgrass to keep it warm. Sprague picks up the turtle and is surprised to see some movement. “Hey, it’s alive,” he said. It’s very late in the stranding season, which starts in early November, and this turtle has probably been struggling for weeks after making its fateful turn into the bay months back when the weather was warm. The Kemp’s ridleys are born in the Gulf of Mexico, and when they’re juveniles, between the ages of 2 and 5, some of them will go around Florida, get caught in the Gulf Stream, and make a northern pilgrimage. It is something they do only once in their lives, and this turtle — like a record number this year — went too far north, came around Provincetown into Cape Cod Bay and become caught in a geographic headlock. For a few months, life was great for the turtle — the water was warm and the crabs these turtles feast on were plentiful. But in September, as the water temperature began to drop and its body told it that it was time to head south, the turtle was unable to solve the riddle of Cape Cod Bay. To go south, it would first have to swim far north, around the tip of Provincetown. By November, with water temperatures diving toward 50 degrees, the turtle became “cold-stunned,” a condition that renders it essentially immobile. To survive, the Kemp’s ridleys need serendipity. First, a strong west wind must blow them ashore and strand them on the beach. Then, a human must find them, quickly, before the cold air finishes them off. From there, they must be rushed to the New England Aquarium’s animal care center in Quincy, where they will begin the long road to health. In a typical year, 80-90 percent of the turtles that reach Quincy alive will live to be released. But this is not a typical year. A typical year involves about 90 Kemp’s ridleys making it to Quincy. This year there have been more than 650. The turtle Sprague held in his arms Thursday morning is number 1,048 for the year on Cape Cod, including those that were found dead. The previous record was 412, but a typical year is closer to 200. The crush has stressed the entire rescue chain, from the volunteers who walk the beaches after high tide looking for the turtles to the aquarium facility in Quincy, which has been so overwhelmed with turtles that it ran out of the markers it uses to number each shell. To keep up with the arrivals, the facility has had to ship large numbers of turtles to marine care centers around the country. 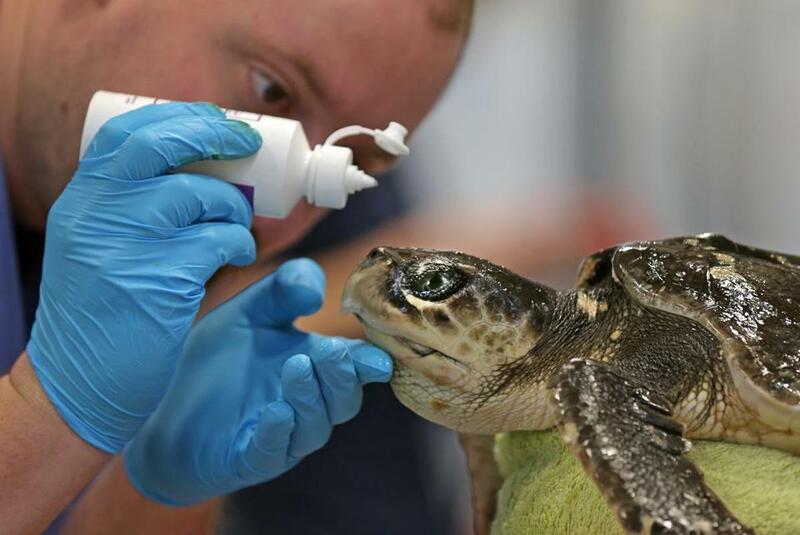 Skip Graf of Mystic Aquarium tended to a rescued, ailing Kemp’s ridley sea turtle at the New England Aquarium’s marine rehabilitation facility in Quincy. In Wellfleet, the Mass Audubon wildlife sanctuary that has long served as the staging area for the rescues turned into a round-the-clock turtle hospital because there was no room in Quincy. Aquariums from around the country sent staff. Local veterinarians came, gratis. Local businesses brought doughnuts and sandwiches and pizza. Local residents brought blankets and towels and little pools for the turtles to swim in, and began walking the beaches all through the night. But Prescott, like many who have worked tirelessly to save the Kemp’s ridleys, believes that what’s happening now could actually be a good thing. The best theory, the optimistic theory, is that the reason there are so many strandings is because of successful conservation efforts at their hatching site in Mexico. There are simply more juvenile turtles. This week was slow on the Cape, finally, but on Thursday the wind shifted out of the west and by 2 p.m., Sprague is loading nine Kemp’s and a much-larger Loggerhead turtle into the back of a station wagon headed for Quincy. Two hours later, they arrive at the back door to the aquarium facility — in a nondescript warehouse in the Fore River Shipyard — and the staff rushes the boxes inside. They look exasperated at bringing 10 more turtles inside, raising the number in house to about 260 in a facility built for 70. They will get some relief the following morning when 50 are flown via private plane to a care center in Texas. On Saturday, the medical staff that has driven up from the National Aquarium in Baltimore to help in Quincy took 21 back with them. “This terrifies me,” said Connie Merigo, the director of the aquarium’s Marine Animal Rescue Program, as she watched the staff begin the triage process to identify the most critical turtles. “They’re very emaciated,” Merigo said as she bent down to look at the turtle Sprague picked up that morning on Corn Hill Beach in Truro. Merigo says she and her staff are physically and emotionally exhausted after running on overdrive for a month. It’s not lost on her, she said, that she is standing in a room filled with more specimens of an endangered animal than most people will see in a lifetime, and they will save most of their lives. It is also not lost on her, she said, that the crush means they will lose some this year that they wouldn’t in another year. The Kemp’s stranding season will be over soon, but the work won’t be done. Loggerheads are next. They are much larger than the Kemp’s, and take up much more space in the tanks. One year, the wildlife sanctuary had 100 Loggerheads strand. Their stranding season is just getting going.